For Whom? Anyone interested in learning to prepare healthy yummy foods! When? Sunday afternoons at 4pm; see dates for specific classes below. Classes will be taught in series and you are welcome to join in where it suits you! How much? Class 1 is $25 in advance, $30 drop in; classes 2 and 3 are each $55 in advance, $60 drop in. Advance purchase will be helpful in determining whether we have adequate enrollment to move ahead with the class; drop ins will be on a space-available basis. You can pre-purchase the whole series for $125. 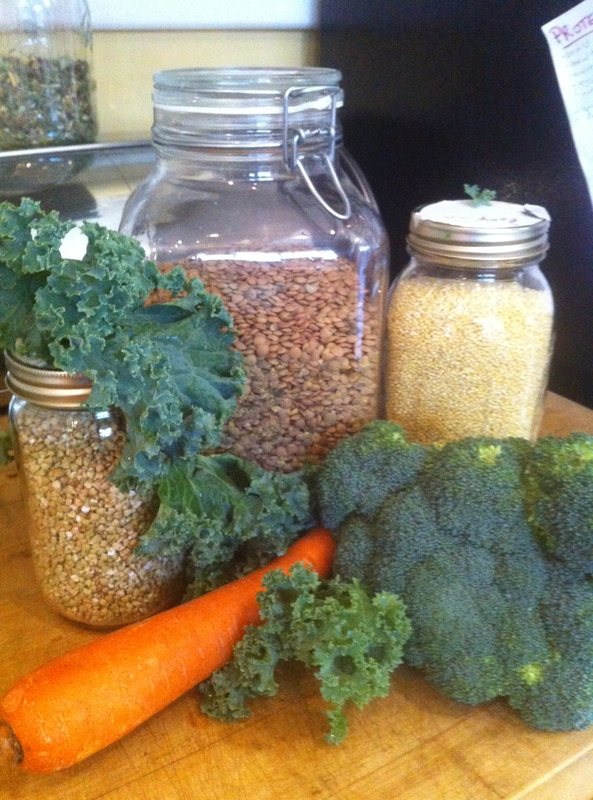 Basics Class 1 Oct 14th/4pm-5:30: Meeting your ingredients, equipment, and your taste buds We’ll look at different varieties of grains and beans and their general characteristics and uses, seasonal vegetables, health-supportive oils, low-impact sweeteners, and seasonings and the 6 tastes. This class will be discussion only. In this class, we’ll build on our understanding of ingredients from the first class and learn about proper preparation of beans, grains, and vegetables. We’ll look at soaking and sprouting beans and grains, 3 of my favorite vegetable preparation techniques, and proper use of seasoning to satisfy the whole palette and increase the health-supportive qualities of foods. In this class, we’ll start with some discussion and then move into the kitchen for demonstration and tasting. Basics Class 3: Nov 4/4pm-6pm: Simple, Surprisingly Delicious Meals. In the third class of the basics series, we’ll build on our knowledge of healthy, whole foods and proper food preparation techniques and learn how to create simple, delicious meals in a way that’s sustainable in our lives. We’ll talk about prioritizing food and its preparation, but also setting ourselves up for success in terms of a healthy, joyful food and cooking connection in our reality. We’ll do a slow-c00ked meal, a saute, a soup, and a veggie burger. The goal will be for you to go home with four basic recipes and an understanding of how to use them as a base for countless others. In this class, we’ll start with some discussion and then move into the kitchen for demonstration, tasting, and gaining a better understanding of how to adjust recipes to suit individual tastes. Everyone has an inner chef; I’m sure of it. Some of you haven’t met that chef yet, but I assure you, s/he is there. I’m really excited to begin a series that will hopefully help you connect to the food that nourishes you and your creative, intuitive foodie self. We will start out with the very basics and move on from class to class in a way that will hopefully expand your palette while creating simplicity and making way for joy in your experience of food preparation. You can jump in and out where you like. The intention of these classes is to provide a foundation and an understanding of delicious and health-supportive food preparation. While we will be creating plant-based and gluten free dishes, the foundation I hope to create can be applied to any eating style and, in fact, will hopefully set you up to know from deep inside which types of food really nourish and sustain your optimal health (and this will be different for every body). Julia’s Kitchen is a working kitchen, rather than a cooking kitchen; classes will be mostly demo, but everyone will have the opportunity to see, stir, smell, and taste-test all throughout the process.